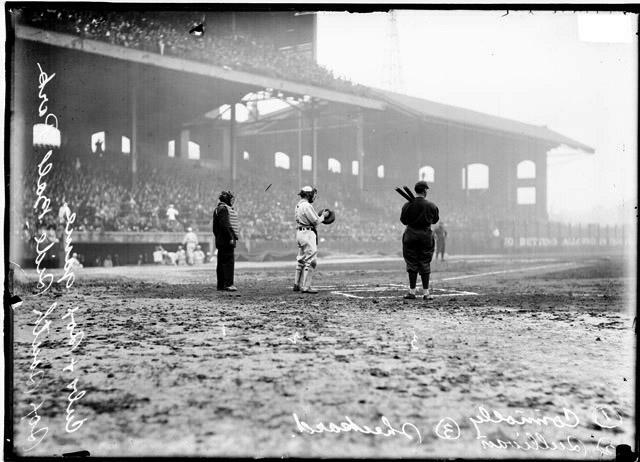 Title [Baseball, City Series, at Comiskey Park, Jimmy Sheckard of the Chicago Cubs preparing to bat, Billy Sullivan catching and umpire T. H. Connolly behind home plate] [graphic]. Collection summary Informal full-length group portrait of baseball catcher Billy Sullivan, of the American League's Chicago White Sox, holding his hands in front of him, standing behind home plate on the field at Comiskey Park in Chicago, Illinois, during a 1912 City Series between the White Sox and the National League's Chicago Cubs. Cubs player Jimmy Sheckard is standing at home plate, holding two baseball bats over his shoulder, and umpire T. H. Connolly is standing behind Sullivan. Comiskey Park was located at 324 West 35th Street and bounded by West 34th Street, South Shield's Avenue (formerly Portland Avenue), and South Wentworth Avenue in the Armour Square community area.